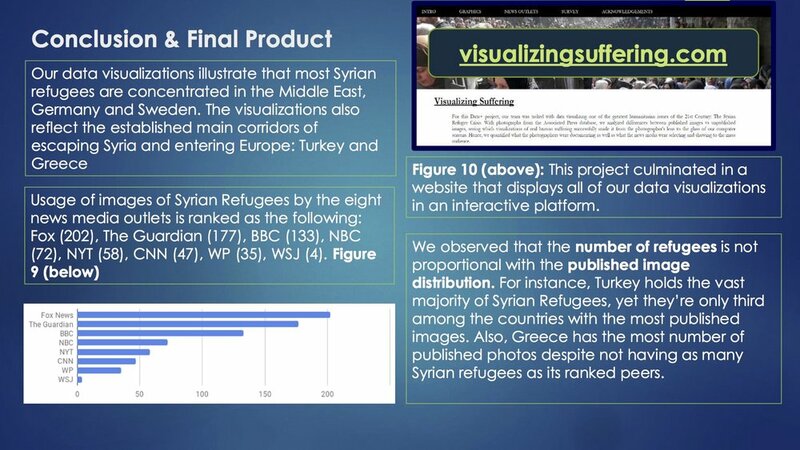 Developed collaboratively with Astrid Giugni, students in our 2017 course "Visualizing Suffering" tracked the distribution of photographs of the Syrian Refugee Crisis. Working at the intersection of visual studies, literature, and data sciences, students engaged in a tightly-focused study of the Crisis in order to consider in-depth complex philosophical and ethical questions: What does suffering look like? How can it be recognized (visually and linguistically)? And what is the relationship between aesthetics and politics in representations of migrants and refugees? Students were tasked with: 1) developing a methodology for digitally tracking image use and distribution; 2) analyzing their collected data looking for visual and linguistic trends and patterns in representations of refugees; and 3) creating a digital visualization representing their findings. Images from their final presentation and their executive summary are pictured below. This course was designed as a part of Duke's Data+ program. Data+ is an intensive summer research program for undergraduates. Its focus is collaborative and interdisciplinary research. See what our students had to say about their experience here. Miniature from the Luttrell Psalter ca. 1335-1340 of Richard the Lionheart unhorsing Saladin. Finding that students struggled to understand why manuscript history mattered to literary analysis, I assigned a manuscript and textual editing research project for an upper-level literature course. Students edited and expanded the Wikipedia article for the fourteenth-century poem Richard Coer de Lyon. A fourteenth-century crusade romance with a complex manuscript history and a fraught place in the study of Anglo-French-Islamic relations, students researched its historical contexts, manuscript history, and literary legacy. In the process of editing the article for publication, students collaborated on historical analysis and examined how editorial biases and cultural ideologies shape our understanding of literature. Partially inspired by the Medieval Feminist Wikipedia Write-In initiative of the Society for Medieval Feminist Scholarship, the assignment prompted conversations about what a text’s manuscript history can tell us about how it was read, the relationship between folklore and historical fact, and the entwinement of gender, race, and religion in crusade narratives. See their edited article here. And read my blog post on this assignment for Duke University's Professional Development blog here. Students in my upcoming English and Medieval and Renaissance studies class on medieval literature and popular culture will construct a "Medievalism(s) Dictionary." À la Raymond Williams' modern text Keywords and Isidore of Seville's medieval compendium Etymologiae, the dictionary's primary focus will be cultural and historical analysis. Using the web-publishing platform Omeka, students will write articles on individual words that they identify as culturally significant, challenging, or difficult. They will research the etymology, its change in usage over time, and its place in the history of the Middle Ages and Medievalism. Because the focus is not just on a word's medieval valences, but on its legacy in Medievalism (that post-medieval investment in medieval forms of life), the dictionary will cover vocabularies both pre- and post-medieval including terms like chivalry, orient, and crusade.